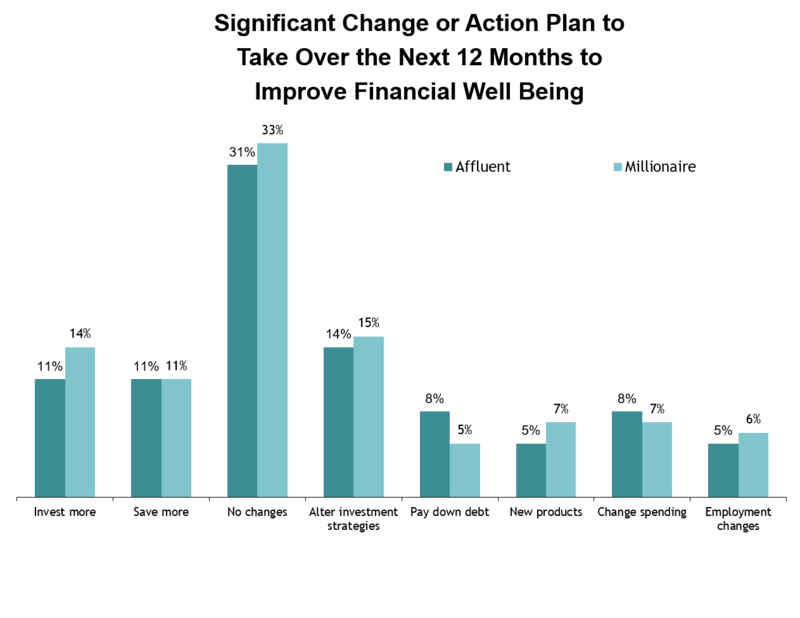 A majority of wealthy investors prefer to create an investment plan and stick to it. The more active strategy is popular among extremely knowledgeable investors who like to try to beat the markets, but most investors are happy seeing their investments grow over time. But the way the stock market has acted in recent months, combined with the uncertainty of government stability, has created a desire to shake things up. The question implies that investors feel the need to improve their financial well-being, and many do not feel that need. The survey results indicate that, as 31 percent said they planned no changes over the next 12 months. But that is a lower percentage of “no change” than in the previous months, and down from 36 percent in October of 2018. So what are wealthy investors planning to do over the next 12 months to battle the uncertain nature of the stock market and present and future governmental matters, like negotiations with China, North Korea, Mexico and Europe? From the previous survey of the same question in October, there was a notable rise in investors who plan to “pay down debt”. That answer got 8 percent of the responses, compared to just 2 percent six months ago. There was also an increase in those responding “new products”, up to 5 percent from 0 percent previously. On the decreasing side, there was also a large drop in those who plan to “alter investment strategies” to 14 percent from 21 percent. That is another indication that making any major changes is a rare occurrence for most investors. Segmented by the employment status of investors, only 24 percent of working investors said they planned “no changes”, a severe drop from 34 percent in October. Where there was a major increase among working investors was in those who plan to pay down debt, from 1 percent in October to 11 percent in January. Seven percent said they planned to look at new products, and in October none of the investors said that was their intended action. Forty-two percent of retired investors answered “no change”, which is not surprising but is higher than the 39 percent in October. Where retired investors added numbers was those who plan to “change spending”, up to 11 percent from 7 percent in October.